Over 75% of our manufacturing customers are Brand Partners, who identify the seaweed ingredients in their products by our brand name. This is entirely voluntary. It provides reassurance to customers and regulatory authorities. The Seagreens name will normally appear in the ingredients section on product packaging. In rare cases we joint brand products, particularly in markets where seaweed is a relatively new ingredient. Brand Partnership brings significant advantages, beyond quality assurance and consumer confidence. At the same time, many products which contain Seagreens, give no indication of doing so. We work with major brands which have a policy of no subsidiary branding. 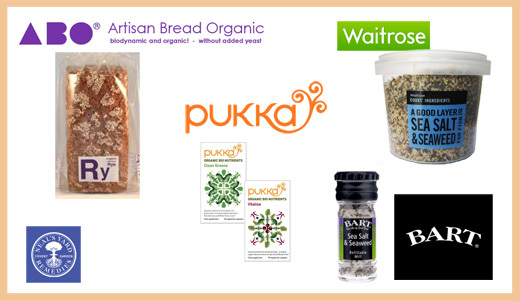 We work with retail brands like Waitrose, with their NPD consultants and contract manufacturers, and with many smaller independent producers like Pukka, recently acquired by Unilever. We work with many nutrition supplement and health product manufacturers like Viridian in England, KeyPharm in Belgium, Bioteekki in Finland, and Tisso in Germany. We supply our ingredients to Food Ingredient Suppliers in several countries. And among these, we have our own appointed Distribution Partners who can supply locally to you. Today, in a single store in the UK, you can find several products containing Seagreens®. This cross-fertilization is of benefit to consumers as well as our customers, because uniquely, the total nutritional composition of Seagreens® seaweed is transparent. Our success and the quality of our ingredients is based on 20 years' experience, five production sites in the British Isles and Nordic region, and 10 years of consistent compositional data from every batch of seaweed produced. When you choose Seagreens®, your customers know what they are eating.